Do you want the ultimate compact powerhouse? This is it. There is no other production light (and possibly modified light) that can directly compare with this light. Available with several different XP-G2 and Nichia emitters, you can choose the perfect emitter for your intended application and taste. The light is currently available in white and black body colors (more black are on order). Please see this link for the User Manual, which details the extensive user interface options. Here is an extensive YouTube video showing the user interface. Does this light come with batteries? What kind of batteries are supported? 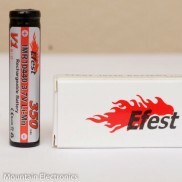 ​Only unprotected button top batteries that are capable of a 10A+ continuous discharge are supported. Please see the recommended battery list below. While other batteries may work, these are the only batteries guaranteed to work. My light won't turn on. I have charged batteries inserted correctly in the light and the button blinks but it won't turn on. What do I do? ​This is usually caused by the lock out feature in the firmware. The light can be locked out to prevent it from accidentally turning on. To disable (or enable) the lock out, click the button 6 times. I'm confused by the different LED and tint options. Which light should I get? Tint. Cool white, neutral white, or warm white. Tint is determined by the color temperature of the LED output, which is measured in units of Kelvin, or K for short. As the Kelvin number increases, the tint becomes cooler. In my experience, most people are happy with either the cool white or neutral white options in the Meteor, although some definitely prefer the warmer options. Many find that the warmer options are easier on the eyes and provide a more soothing beam pattern. Neutral white is closest to daylight white, while traditional tungsten lightbulbs are generally a very warm light. Lumens. This is the overall quantity of light emitted by the light. This does not determine how far the light will shine. 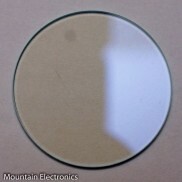 Generally, the cooler tint LEDs provide slightly more lumens output than the warmer tint LEDs. Intensity. This is the measure of how bright the most focused part of the beam is. This measurement determines the light's "throw", or how far the light beam can shine and still illuminate objects to a certain level. CRI. CRI is short for "color rendering index". It is a quantitative measurement of how faithfully a light source reveals colors of various objects. The higher the CRI, the more faithfully the light can render color. 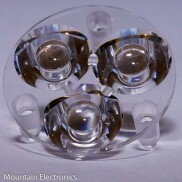 Most quality LEDs are in the 65-70 CRI range, while 80+ CRI is generally considered to be "high CRI". CRI is especially important if the light is to be used for photographic, videographic, or examination purposes where color rendition is crucial. 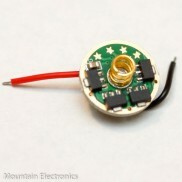 Nichia 219C 90+ CRI | Neutral White - This is probably the highest output 90+ CRI handheld light in existance! If color quality is your priority, then this is your light! Batteries must be button top, or have a raised top. Protected batteries not supported. 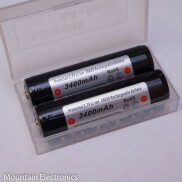 Most flat top batteries are too short, even if they have a raised top.